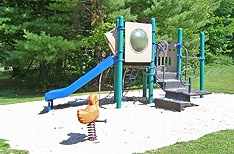 Situated on 43 acres of Maine woodland, our sites and facilities are nestled among majestic pines and birches on the shore of Long Lake. Four Seasons offers a number of both wooded and lakefront campsites, as well as travel trailer rentals for families of all sizes. 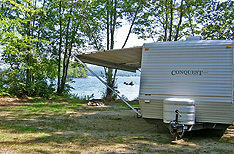 All campsite and trailer rentals subject to 9% Maine Lodging Tax. Family Camping: A family consists of two adults and their unmarried children. All others are considered guests. Maximum 4 adults per site. Pet Policy: Camper’s pets allowed. No pets in rental units. Visitors may not bring pets. Pets must be leashed at all times. With our location directly on beautiful Long Lake, opportunities for boating are abundant. In addition to waterfront sites, some with their own private boat docks, we offer a boat harbor, ramp and docking. You may bring your own boat or rent a canoe, kayak or rowboat. Personal watercraft (Jet Skis, etc.) are NOT allowed. Four Seasons Camping Area is pleased to offer its guests this opportunity to make online reservations for both campsites and rental trailers. Please complete this entire form prior to pressing the “Submit” button. Items marked with an asterisk (*) indicate required fields. All sites are subject to availability. Please understand that this is strictly a Reservation Request Form. You do not have an actual reservation until it has been confirmed, and a reservation can not be confirmed until your deposit has been processed and authorized. For your convenience, we accept Visa, MasterCard and Discover cards. If you need to confirm your reservation immediately or would like to make a reservation for an arrival within less than 48 hours, please call us during normal business hours. We will contact you via e-mail within 24 hours of our receipt of your reservation request. If space is not available for the date(s) requested, we will convey our regrets. If space is available, we will contact you in order to obtain the necessary reservation deposit. Please be sure to include a valid telephone number and e-mail address with all reservation requests. If you fail to supply us with your credit card information within 48 hours of the time when your tentative confirmation has been sent, your initial reservation request shall be considered null and void. If you prefer, you may print this form and mail it to us, if time allows. However you choose, we thank you for choosing Four Seasons Camping Area and look forward to your visit. Thank you! 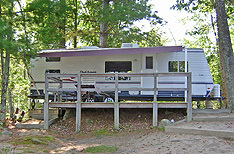 $625.00 per week on site 10A, $550.00 per week on site 19A, and $300.00 - $350.00 per week on travel trailers. Campsite & Rental Cancellations: 30 day notice required for a refund; $15 handling fee applies. as well as our complete resort rules, regulations and policies.